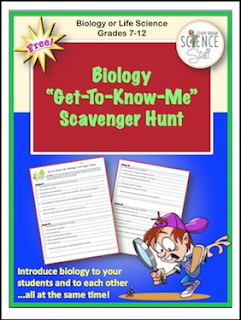 This biology scavenger hunt can be used at any time, but it is perfect for a back to school activity! Students go outside (playground, school yard, nearby park) to find and describe 16 different biological terms and concepts found in nature. This activity will get your students up out of their seats for a fun and educational activity during the first week of school. 1. It allows you to introduce classroom procedures (particularly lab procedures) at the beginning of school. 2. It allows you to assess the knowledge and skill level of your students who are just entering your class. 3. It provides a mechanism for the students to get to know one another.